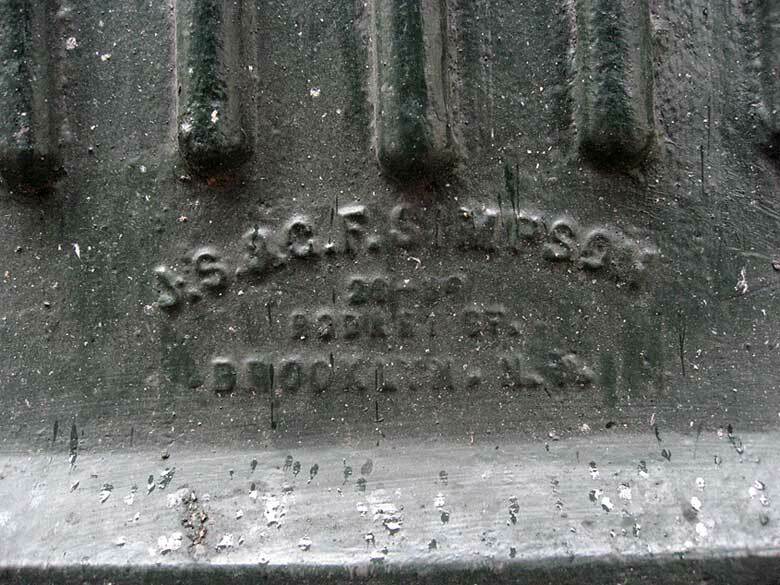 J. S. & G. F. Simpson were successors to H. B. Scholes' North Brooklyn Iron Foundry. Henry B. Scholes operated the North Brooklyn Iron Foundry in the Williamsburgh section of Brooklyn from approximately 1867 to 1877. The foundry was located on Kent Ave. at the corner of Ross St. for several years, then moved to Rodney St. near Kent Av. These addresses are within a block of one another. A story in the Brooklyn Daily Eagle, 29 July 1872, p. 2, indicates that Scholes "built on the opposite side of Kent avenue" around that time. This ad appeared in a Brooklyn city directory in 1875. Henry Bride Scholes (1828-1910) was born Feb., 1828, in England, and died at his residence, 599 Bedford Ave., Brooklyn, 16 March 1910, in his 83d year. He was recorded in the 1900 U. S. Census living at 575 Bedford Ave., Brooklyn, when he was 72 years old. The census indicates that he immigrated to the U. S. as an infant in 1829. Around 1877 Scholes gave up his iron foundry and went into the coal business. The 1880 U. S. Census recorded him living at 119 Bedford Ave., Brooklyn, when he gave his occupation as "Coal Dealer." He was 52 years old at that time (click for Scholes ad as coal and wood dealer in 1879). This ad appeared in a Brooklyn city directory in 1879. The Simpsons were James S. Simpson (1850-1908) and George Frederick Simpson (1851-?). In 1880 James S. Simpson lived at 147 Hooper St., Brooklyn, with his uncle, James F. Scholes. James F. Scholes (1850-? ), a coal merchant, was the son of Frederick Scholes, a brother of Henry B. Scholes, former proprietor of the North Brooklyn Iron Works. The succession of proprietors, then, was within the family. James Simpson was also included in the 1880 U. S. Census. He was 31 years old and lived with his wife, Mary, and daughter, Florence, at 89 Keap St. The 1880 U. S. Census (non-population schedules) recorded the J. S. & G. F. Simpson iron foundry with the following data. The company owned $15,000 in capital and raw materials worth $26,002. They employed as many as 54 workmen, including 46 males above the age of 15, and they paid $24,532 in annual wages. The ordinary work day was 10 hours, and a skilled mechanic was paid $2.50 per day. They were in operation 12 months out of the year. The plant used one boiler for one steam engine with a total of 25 horsepower. The value of the previous year's production was $66,000. In 1885 George F. Simpson, age 34, born 10 Jan. 1851, City of New York, applied for a passport. His wife, Margaret, also applied for a passport. Her passport specified that she was traveling with two minor children, George Frederick Simpson Jr., age 3, and Leslie Derwent Simpson, age 15 months. The family was to travel in England, France and Germany, and they were accompanied by the children's nurse. Both Simpsons were still alive at the time of the 1900 U. S. Census. At that time George F. Simpson was 49 years old and lived at 85 North Mountain Ave., Montclair, New Jersey. He lived with his wife, Margaret, and two sons, George Frederick Jr. and Leslie D. In this same census James Simpson lived at 272 Jefferson Ave., Brooklyn. He was 50 years old and lived with his wife, Mary, a daughter, Florence, and two sons, Henry W. and Curtis C. His mother-in-law, Catherine Chapman, also lived with the family. On 21 April 1908 the New York Times reported that James S. Simpson had died April 19th, at his home, 272 Jefferson Ave., Brooklyn. In the 1890s J. S. & G. F. Simpson became specialists in manufacturing the Bogardus eccentric mill: "will grind any and everything." This ad for Simpson and the Bogardus Patent Universal Eccentric Mill appeared in Trow's New York City Directory, 1890, while a slightly later ad for the Bogardus Mill appeared in Lain's Brooklyn and Long Island Business Directory, 1892. In 1908 both James S. Simpson and George F. Simpson were dead. This ad for the Bogardus Eccentric Mill refers the reader to the "Estate of James S. Simpson." 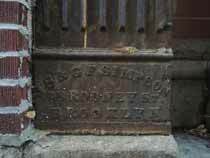 J. S. & G. F. Simpson also manufactured coal chute covers. One of these is found at 57 E. 74th St.
Henry B. Scholes had a brother, Frederick Scholes (1823-1905), who operated a brimstone factory in Brooklyn as early as 1851. This business was also known as the Brooklyn Sulphur Works and was located on Kent Avenue at the corner of Ross St. In the 1900 U. S. Census Frederick Scholes, age 75, still described himself as a "brimstone manufacturer." Eugene L. Armbruster in Brooklyn's Eastern District, 1942 (completed 1928), described him as follows, "Frederick Scholes was born in England in 1824. He came with his family to Newtown, L. I., in 1829. His father, James Scholes, bought in 1831 a farm in North Brooklyn, which had been owned in 1795 by Jeremiah Remsen. Frederick Scholes settled on this farm. The sulphur refinery at the foot of Ross Street was located on a part of this farm. Frederick Scholes married in 1850 Anna M. Boice of Brooklyn. His daughter, Mary E. Scholes married in 1870 Edwin B. Havens, who was born at Orient, L. I., in 1847. Frederick Scholes owned the block on the west side of Bedford Avenue between Keap and Hooper Streets, running back to Wythe Avenue. The flower garden occupied the greater part of this block. He built a house on either end of the block, one for his own use and the other for his son. His residence was known as No. 113 Keap Street and his son James F. Scholes resided at No. 119 Hooper Street. Frederick Scholes was supervisor of the 19th Ward. The Eastern District Y. W. C. A. building on Bedford Avenue and Keap Street, erected on a portion of the Scholes block, was opened on November 1, 1914." A son of Frederick Scholes was James Frederick Scholes (1850-1905). 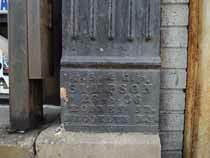 James F. Scholes, initially a cooper, became a truckman, located at 152 Kent Ave., Brooklyn, the address of his father's sulphur works, and later nearby on Wythe Avenue. On his death the following appeared in the Brooklyn Daily Eagle, Friday, 1 Dec. 1905, p. 14, "Funeral services over the remains of James F. Scholes, son of the late Frederick Scholes, will be held at his late home, 119 Hooper street, to-night at 8 o'clock. Mr. Scholes had long carried on a trucking and livery business at Wythe avenue and Hooper streets, though he had latterly devoted himself to trucking. Mr. Scholes was born in Brooklyn and had always lived in the Eastern District. His death was due to diabetes, from which had been a sufferer for two years. He had been in a sanitarium for two weeks. He leaves a widow, three sons and a daughter. He was a charter member of the Hanover Club, the only organization to which he belonged, though he was appreciated for his social characteristics." This ad for the Jas. F. Scholes Co. appeared in the Monthly Bulletin of the Engineers Society of Pennsylvania, Third Series, No. 12, December, 1911. The C. S. Scholes mentioned in the ad was Clinton S. Scholes (1885-1958), James Scholes' son. 2259 Adam Clayton Powell Jr. Blvd.